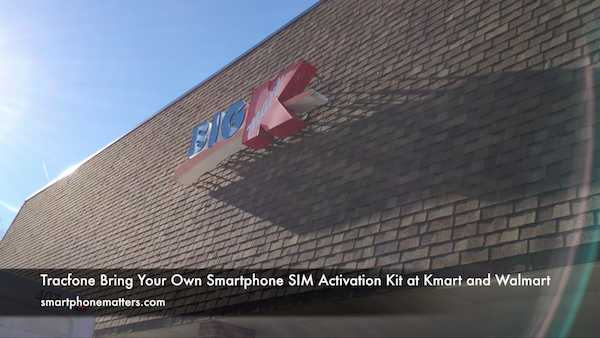 Recently I was shopping at Kmart and I noticed they had Tracfone Bring Your Own Smartphone SIM Activation Kits so I thought I’d share this video. The Tracfone Bring Your Own Smartphone SIM Activation Kit. This kit comes with standard, micro, and nano SIMs for both Tracfone’s ATT GSM LTE network and Tracfone’s Verizon CDMA LTE network. The kit also comes with a 90 day service plan that includes 180 minutes of talk, 180 text messages, and 180 MB of data. The kit retails for $29.99. This is very exciting for people who want the benefits of a smartphone, but don’t want to spend a lot of money cellular service or don’t need to make a lot of calls, send or receive text messages, or cellular data. Many people are perfectly happy using WiFi at home or the office to connect their phones to the internet. One of the most popular videos on my channel were my use an iPhone for $7 a month from 2014. Back then, Tracfone BYOP only supported CDMA phones on the Verizon network. You couldn’t use their ATT network and their was no 4G LTE. I didn’t buy this kit in Kmart because I had already picked up a similar kit in Walmart towards the end of last year. I plan to try that out soon. I hope to set up both a GSM LTE and CDMA LTE phone to show you guys how to use both.